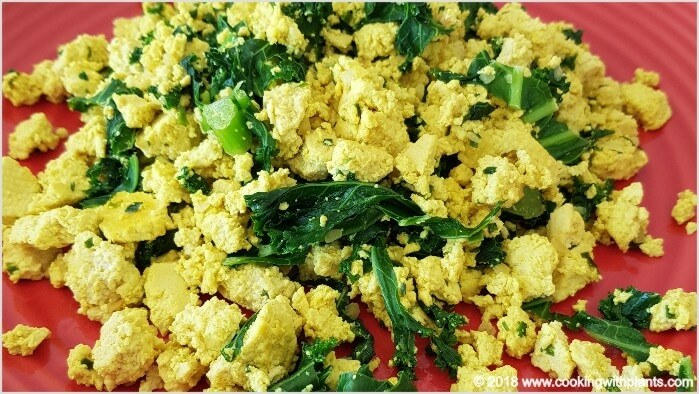 This delicious tofu scramble is quick and easy to make and is loaded with immune boosting greens that your body will thank you for. The recipe for this is actually from my cookbook 15 minute meals… just one of 100 simple 15 minute meals that you can make in a snap whenever you’re pushed for time or don’t know what to cook. Eating fast and tasty tofu scrambled “eggs” has never been so easy. I love this for breakfast, lunch or dinner. Enjoy! Firstly you will need a large frying pan. Crumble up the tofu into small pieces so it takes on the look of scrambled eggs. Put aside about half a cup of water next to the frypan in case you will need it should the tofu begins to stick to the pan. Stirring regularly, heat the scramble through and stir for about 5 minutes.